In the last installment of the OS Wars, we put Windows and Mac OS X head to head in customization. Windows walked away with an easy victory, with much easier ways to customize software and hardware. In this round, we are going to take a look at the bundled apps that come with the Operating Systems. Since the infancy of both operating systems, simple applications have been bundled like a Calculator and a text manipulator. With the age of computing shifting towards media-centric tasks, these bundled applications have become more robust and useful. With this being said, this is mostly a comparison of iLife and Windows Live Essentials. Even though Essentials is not pre-installed on Windows, its easily download for free through Windows Update. iPhoto may seem like an obvious favorite here, but in reality Windows Photo Gallery is very functional and does the same tasks that iPhoto does. These include Face Recognition, Geo Tagging, Social Media integration, and basic photo editing. However, where iPhoto really excels is not in the raw features, but how they are implemented. Apple does a great job of making things easy to do, while still allowing powerful options. For that reason alone, iPhoto wins this one. This again is a spot where Apple would seem like an obvious winner. However, Movie Maker is a robust and easy to use program with a lot of features. It is a great program to have installed, and works well for most needs. iMovie is very similar in features to Movie Maker, but again Apple's implementation seems more robust then Microsoft's. Features are well organized, easy to use and robust. One reason for the robust features is the fact that iMovies big brother Final Cut, is an industry standard and shares some of the more simple Advanced features. Again, Apple comes ahead in this portion. This is the part where Microsoft makes a swift comeback. Apple's media playback option is called Front Row, and is overly simple and honestly pretty useless. It lacks any unique features from iTunes and has no options for customization. Windows Media Center however, is a terrific program with tons of useful features. Options to watch and record live TV along with Internet Radio make it a perfect Living Room companion. Companies like Reycom have even developed boxes with Windows Media Center embedded in them. Front Row was embedded in the first Apple TV OS, but since then has been left behind its set-top box companion. Windows runs aways with this round, easily stomping Front Row. 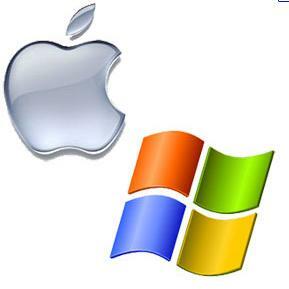 Most Windows users I know, no matter how much they hate Apple want GarageBand or something close to it. This has yet to happen, and GarageBand stands on its own. Apple wins this one due to lack of competition. It is clear that iLife is a great Mac feature. It offers clean programs, with easy integration with the Operating System. It fits right into Mac OS X. Windows Live Essentials is a great suite of applications, but is clearly an afterthought to an Operating System made to be more customizable, with a clean slate. Mac OS X does win this round, which ties the score at 1. Stay Tuned for the next round of OS wars! Nothing is even close to being decided and the battle is heating up. Got a problem with this rounds comparison? Are there applications that you wish had been included? Let us know in the comments.